1. Memo-Scanner For Benz S&E-Class is newly developed and specially designed for car owners or DIYs. With a Memo Scanner, you may quickly find out trouble causes of electronically controlled systems on your car by reading the trouble code (DTC) shown on Memo-Scanner and checking out trouble causes with attached MANUAL. 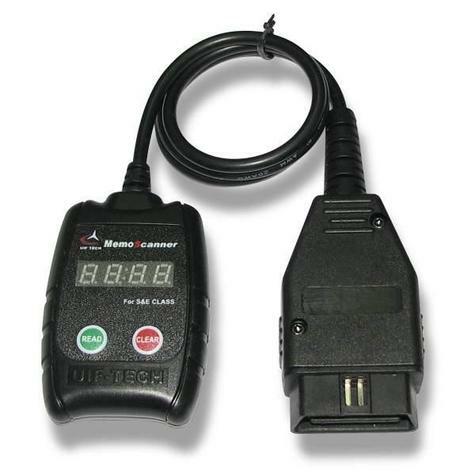 When the"CHECK ENGINE" light is on, stop the car and apply the parking brake, start the engine then plug the Memo Scanner to the 16-pin socket usually located under the instrument panel in the car. then press the "READ" button, it will read the trouble code reader trouble code and display 3 times. If there is no trouble codes, it will display [-- -- -- --].